Let me skip all the introductions and get straight to open-mouthed admiration. Dervla Murphy is the greatest travel writer that I've ever come across and each of her books passing my way only confirms it. 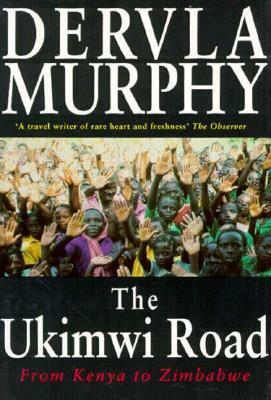 This time I managed to get hold of The Ukimwi Road, a travel memoir from Africa. Physical endurance and ability to survive in difficult environment are not Murphy's only enviable traits. She can write, there's no doubt about it. Her accounts of people encountered on the road are masterful, full of colour and exotic flavour. Often a generous serving of food for thought is thrown into the bargain. Even landscape descriptions, my least favourite aspect of any travel writing, are evocative enough to enjoy when Dervla Murphy is spinning her tales. Still, The Ukimwi Road is not only about pretty sights and quirky locals. 'Ukimwi' in Swahili means AIDS. Willy-nilly, as there's no escaping evidence of the illness in the areas she travelled through, Murphy's African journey turned into an AIDS chronicle. I am impressed by how she tackled the subject - with kindness and compassion, but without fundraiser-like hypocrisy. Murphy rarely uses emotion-evoking vocabulary in her stories. She just tell readers of what she sees, as she sees it, and this is usually enough to feel shattered by the dark side of reality. Speaking of fundraisers, don't they get a lashing in The Ukimwi Road! I am very much against charity institutions - anyone who begs for money for starving children and then pays himself a few hundred thousand euros/dollars in salary deserves to be lynched in my book. If Murphy is to be believed (and I can't see why not), recipients of charitable aid are just as aware of this ugly dissonance, and they don't like it more than I do. For details, read the book. I admit I have copied quite a few quotes for future reference. All in all, The Ukimwi Road is a masterpiece of travel writing. One of the best (if not THE best) I've ever read. Highest praise.